Up until my middle teens I was brought up in Pound Lane, Bowers Gifford, Pitsea. My mothers parents moved from Bermondsey, South London to a little cottage called Dulci Doman in North Benfleet in the early 1920s. This cottage had a large piece of ground which my grandfather turned into a small holding, on which he kept cows, pigs, geese, chickens and pony's, etc. His sister used to drive from London to Pound Lane in a 'Twin Set' (a large trap pulled by two horses) to stay for a weekend in the country. In those days land was very cheap, and he bought several plots in the Pound Lane/Clifton Road area. He opened up a small general stores in Clifton Road called Clifton Stores. Later he built a row of bungalows, and a larger shop in Pound Lane, also called Clifton Stores, then moving into the new shop in 1927. He also opened up a shoe shop in Pitsea. My mother ran the general stores for my grandfather after he retired. My uncle took over the running of the shoe shop. My mother outside the stores in 1927. Note the Browne's Tea advertisement. stores and some Pound Lane bungalows. Many of the roads were unmade and had large ruts in them; these were the plotland roads where plots of land were sold back in the 1920s at £5 a plot. People mostly from London bought these plots and built small wooden bungalows on them to use as weekend holiday homes. After the war, due to bomb damage, a lot were made homeless, and had to move into their plotland holiday homes. An annual funfair used to hire my mothers field at the back of our house. I used to look forward to seeing and riding on the huge steam showman's engine that used to drive the Gallopers and provide the lighting for the fair. When I started school at St. Margaret's, Bowers Gifford, a Mr Jack Campbell used to run a school bus. It was an old Bedford coach, that always stank of petrol. The bus fare was one old penny. The teachers at the school then were: Miss Balaam, Miss Lloyd, Miss Seabrooke, Miss Ashton and Miss Ashton's sister was head teacher, who we had to call Madam. In later years we had a male teacher, a Mr Mitchell, who we had to call sir. Each morning we had to attend chapel at St. John's in the school grounds. Father Heathwood would take the service, and afterwards we would be marched in single file back to the class room with Miss Balaam taking the lead. A wonderful lady who had total control over the children, if there was the slightest murmur in class when she was writing at her desk, she would only have to look over the top of her glasses, and without saying a word, it would all go silent. 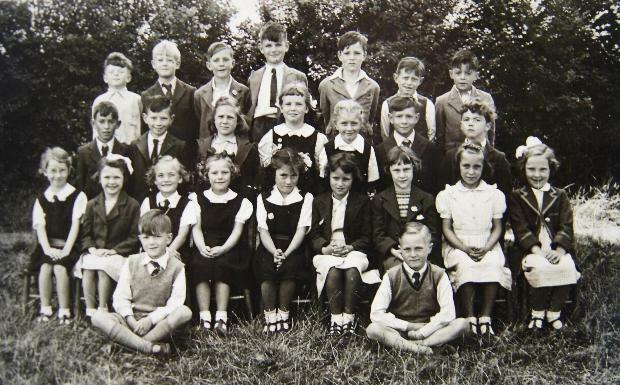 Miss Seabrooke's class, St. Margaret's School, Bowers Gifford. I'm in the third row from the front, far right. In the late 1940s, St. Margaret's School had its own kitchens and dining hall, which was behind St. John's Chapel (now all demolished). In those days there were three lady cooks, (later called dinner lady's). All the food was prepared and cooked in the kitchens by these three lady's. I was made dinner monitor for the first sitting. At lunch time (called dinner time back then) I had to leave class early and go to the dinning hall to set up and lay my table with knives, forks and spoons. There were eight places on each table, and six tables, each with its own monitor. When the bell rang, the first sitting would arrive at the hall and take their places. It was then my job to collect two plates from the plate table, and go to the serving area where the cooks would serve the food onto the plates. I would then return to the table to serve the boys with their dinner. I would repeat this four times, on the last trip the cooks would ask which plate was mine, on which they would add extra helpings. The cooks made a special mash potato which was roasted called 'bait' why it had this name I don't know. Nearly all the boys liked this as it was delicious, and it soon ran low, but the cooks always made sure there was enough left for the dinner monitors, as we had our food last. When my table had finished eating I gathered up all the dirty plates and placed them into a large sink, any food left over was scraped into the 'pig bin'. A repeat performance was made with the desert, again extra was given to the monitors (perks of the job!). In later years the kitchens were closed down and all the hot food was delivered in large metal containers, the food never tasted the same. The cooks were then renamed dinner lady's. Some of the seasonal games we played and things we did at St. Margaret's are still played today, but some are long forgotten or forbidden. The winters back then were very cold unlike today. In January and February there was always days of hard frost and sometimes snow. Waking up on these frosty mornings, the first thing you noticed was all the patterns on the windows, made by 'Jack Frost'. It was if someone had etched these on the glass in the night. Out in the playground white cobwebs in the hedges glisten in the early morning sun, and if there were any large puddles frozen over, these were immediately made into slides. Bigger and much longer slides were made if it had been snowing before the frost, some of these were 10 to 14 yards long (9 to 13 metres). We would run up towards these at full pelt then turning sideways slide along to the end. In the spring on Mayday we would help put the 'Maypole' up, this pole was about 12 feet high. It was painted with flowers and had 20 multi-coloured ribbons hanging from the top of the pole to the ground. Two circles of children would gather around the pole, forming an inner circle and outer circle. Each child held a ribbon and fanning out from the pole, would then dance around the pole to music, the outer circle going in a clockwise direction, and the inner circle going in a anticlockwise direction. The ribbons slowly winding themselves down the pole, then the music would stop, the children would turn around and dance back in the other direction until all the ribbons had unwound from the pole. Then there was marble season, where we would roll coloured glass marbles towards a drain cover trying to get the marble to drop into the hand recesses in the cover. Cigarette cards which we would 'flick' against a wall trying to get it to land on top of another card that was on the ground. 'He' was another game we played, if you where chased and touched by another child, then you became 'It', so you had to chase after someone to touch them, then they became 'It', and so on. Autumn was 'Conker' season where you looked for the largest horse-chestnut you could find, make a hole through it with a skewer, pass a piece of string through the hole which had a big knot at one end which the conker sat on. Then the game was on to see who had the hardest conker, by taking it in turns to hit each others conker until one of them split and fell off the string. Opposite the school was a little sweet shop called Reddingtons. In here you could buy Black Jacks at 4 for a penny, or Gobb Stoppers at a penny each, Bubble Gum, again one penny, Lemonade Powder in little bags or Sherbet in little tubes with a Liquorice straw. A little way past this shop was a Blacksmiths run by a Mr Markham. I often stopped and watched him shoe a horse, and sometimes if I was lucky I would watch him and his mate shrinking a new iron tyre on a wooden cart wheel, first by heating it red hot on the fire, then after it was on the wheel, throwing buckets of cold water on it to shrink it so that it was tight. On Saturday mornings there was children's matinée at The Century cinema in Pitsea. Most of the films were westerns, Hopalong Cassidy, The Lone Ranger, etc. In the summer months I used to go gleaning for wheat after harvest at 'Jacksons Farm' North Benfleet as my mother had a lot of chickens. There also used to be a lot of carp fish in the farm pond, and many a happy hour was had with rod and line. Then one day someone put a large pike in the pond which put paid to all the carp. In the late 1950s I used to help with the Sunday service at All Saints Church, North Benfleet. My job was getting there an hour before the service to light the oil lamps that kept the church warm in the winter, ring the bell, and take the collection. The Rector then was Reverend Hughes, who would arrive at the church on a green BSA C15 motor cycle with his wife on the pillion. He lived at Nevendon Rectory and was also Rector of St. Peter's in Nevendon. Once a year a summer fete was held in the rectory gardens, and at Christmas time a children's party in the nearby Tithe barn. Sadly all this has now gone, only St. Peter's remains. All Saints at North Benfleet has now been closed for many years due to subsidence of the tower, and I believe it is now looked after by the nearby farm. St. John's Chapel at Bowers Gifford has now been demolished including the old school kitchens behind it.